With the original cooling, at a room temperature of about 18ºC, the cores quickly reach 85ºC at 100% load (junction Tmax is 100º). 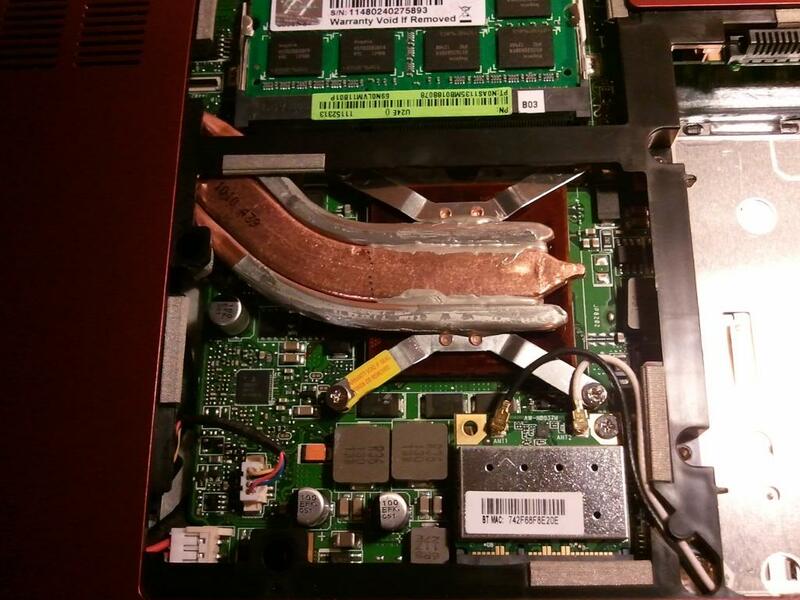 I first tried to put some thermal paste and a fanless chipset-heatsink on top of the heatpipe, over the processor. 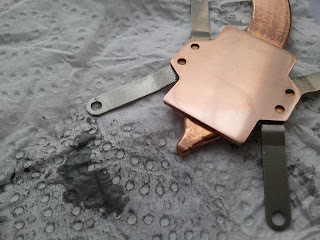 This resulted in instantly lowering the temperature about 10ºC, but as soon as the sink got hot, it couldn't handle the dissipation of the heat just by natural convection. Test attaching a heatsink over the processor. So, adding any mass there wouldn't help. 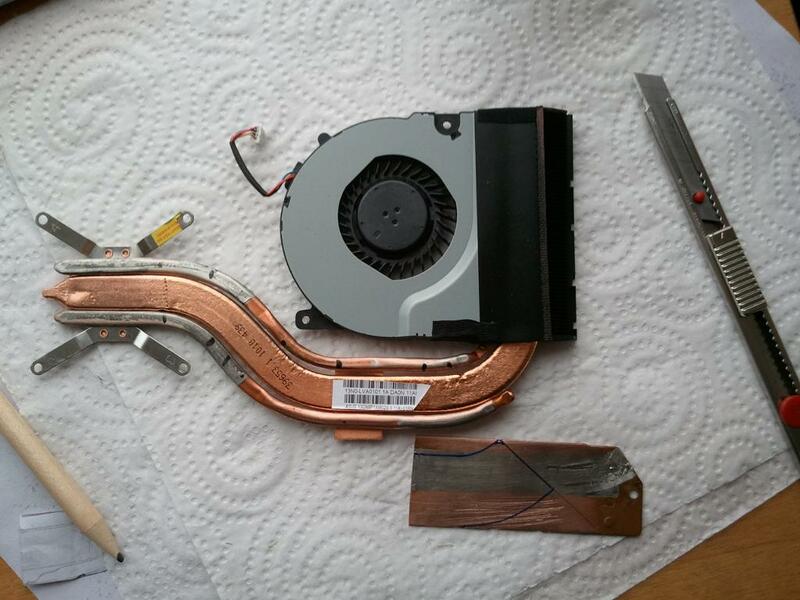 Then I thought about adding a new heatpipe, as seen in many gamer laptops that have several pipes in parallel. I was lucky to savage two small heatpipes from an old laptop, that would fit perfectly in the space left at both sides of the actual heatpipe. 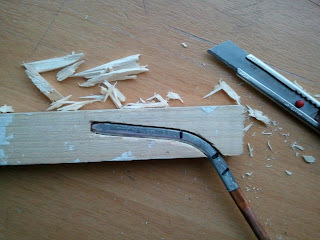 Of course, I would need to flatten and re-bend the pipes in the proper shape. 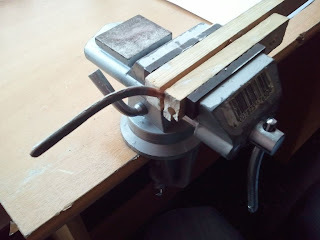 I did it slowly, by gently applying some heat to them in the kitchen fire and with the help of a custom wood mold. 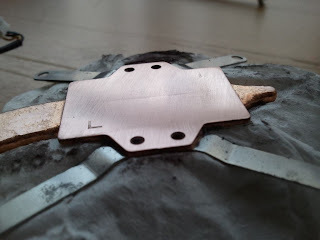 I also made an extra support out of a cooper plate, to increase the heat transfer at the end of the pipes opposite from the processor; and a fitting to fill the gap on one side of the original heatsink (which wasn't properly soldered in the middle, but displaced about 2mm). Piece of cooper to fill the gap, just on one side. After reading this article about efficient cooling with heatpipes, that shows the poor result of a bad cooling configuration, I was afraid of getting an opposite result from my mod. 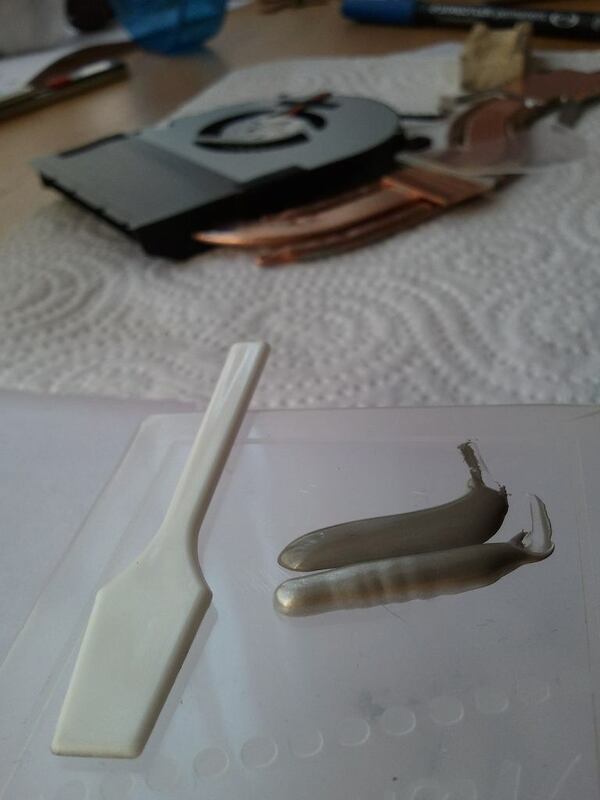 So I did a preliminary test attaching the pieces with some nylon cord and putting a nice amount of thermal paste. 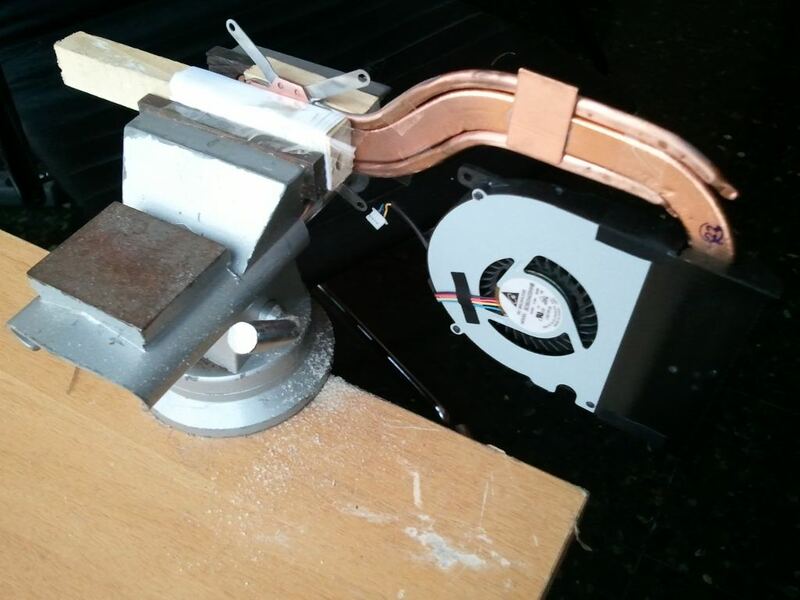 The results were very satisfactory: with prime 95 the temperature took about twice as much time to reach a peak and it never went above 84ºC (without the mod it reached 85º after a few seconds). So I got some thermal adhesive to make the thing permanent. Soldering would probably improve the performance a lot, but I didn't dare to do it, as the lowest melting point solder alloy (179ºC, alloy: SnPb 2%Ag), is almost the maximum recommended temperature of the heatpipes (180ºC). Some pressure to keep the bond as thin as possible. Some lapping of the cooper plate in contact with the processor would also help, as there were some irregularities in it's surface. I noticed the thermal paste made an excellent polishing paste, used together with some regular kitchen paper. Irregular surface of the cooper face. There was a longitudinal line-dent in the middle. The thermal paste ended up shiny as well. In my excitement I forgot to make pictures of the finished piece. But you can see how it looked like when installed. I had to flatten one of the pipes at the tightest point, to be able to put the board in place. The cooling mod finished and in place. Detail of the tightest point between the memory banks and one screw's place. After the mod the temperature playing some very demanding games went down from 85ºC to about 73ºC. 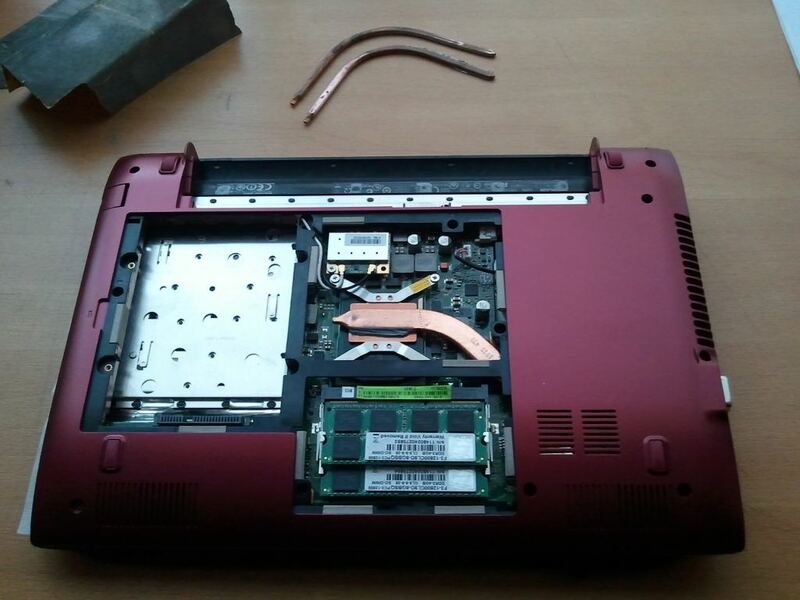 Not as cool as some gamer laptops, but lower than before anyway. We'll see how well it performs in the summer ! Absolutely amazing. 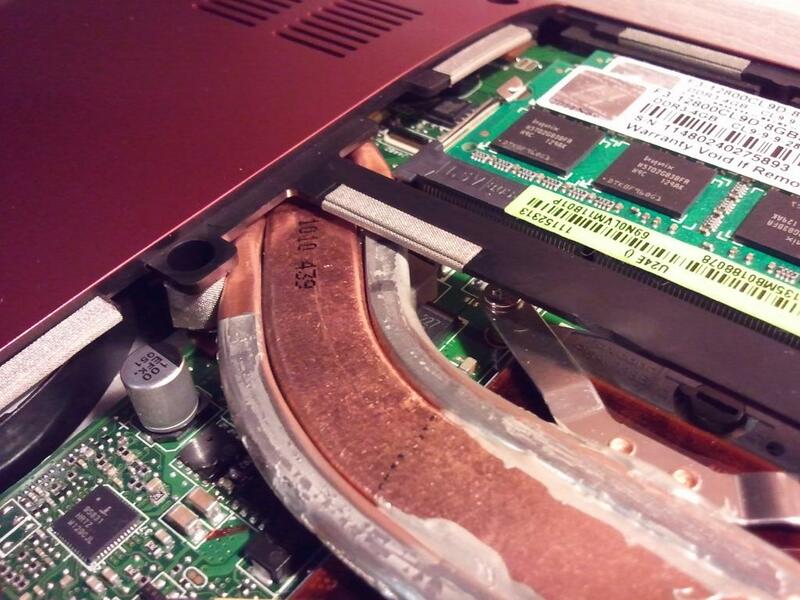 Very nice work and a quad core in a tiny laptop. It is usual that there is a gap between GPU and heatpipe, but filled by a thermal silicone pad. 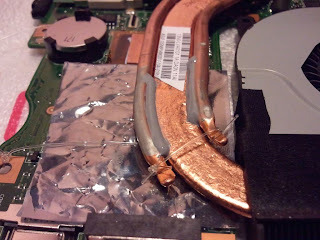 In my case the only GPU is integrated in the CPU, but there is a silicone pad between the chipset IC and the heatpipe. I didn't change anything to reduce that gap. 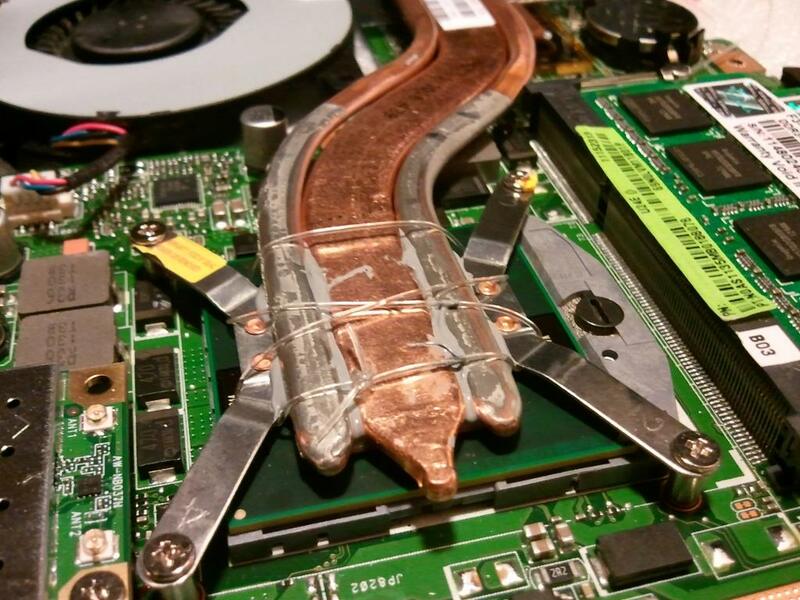 GPUs use to get/work hotter than CPUs, but you could test temporarily putting that shim with thermal paste, to see if it helps, and then make it permanent it with thermal adhesive. 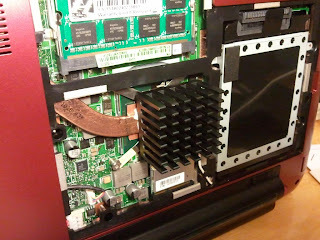 How did you "glued" the chipset-heatsink to the cooper heatsink? I used Arctic Silver Thermal adhesive. However i do see the extra copper pipes ending before touching/attaching to the metal fins surrounding the fan, wouldnt it be better and more efficient if they did? To me it seems that you have just added a piece of metal that takes some heat temporarily, at higher environment temperatures the effect of the extra pipes will be temporary. 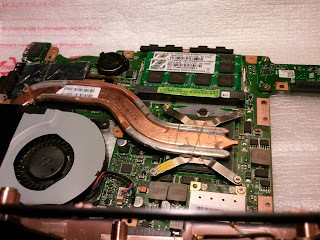 I also thought of this solution for various laptops i repaired however attaching the pipes properly in the end of the line (metal fins around fan) is kinda hard (different metals). I wonder if we/you could drill the pipes and the fins and pass some another pipe throught them with good thermal adhessive compount(mostly thremal , say 10% adhesive) and see how it goes. Of course in the end we will end up changing the fins too but ye, you get my point. the copper heat pipes are shallow tubes pressed down. 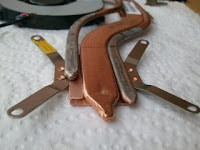 What if we used solid copper rods or something flatter as form to replace even initial heat pipe? Indeed, my mod is not the best solution, as you mention, but it helps (just a little) to transport heat away from the processor. It would have been a headache to adapt the additional pipes to make them benefit from the fins/fan cooling. 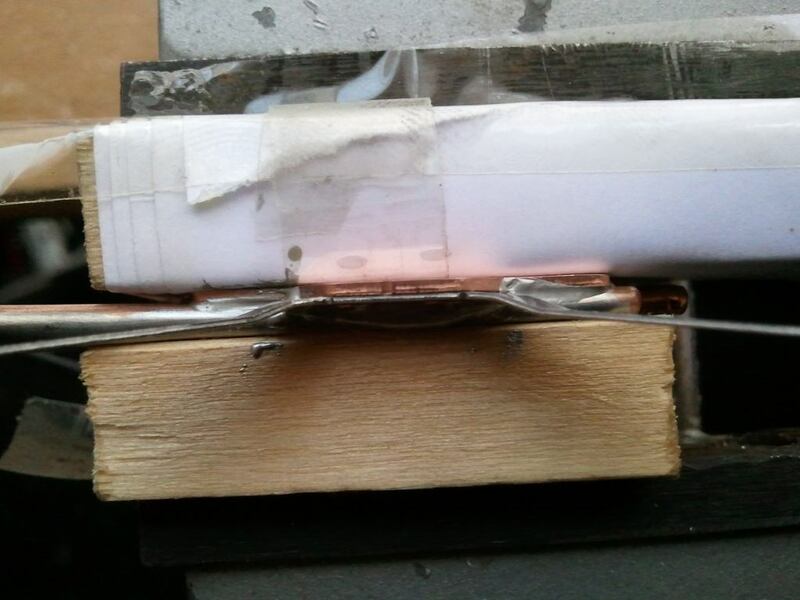 Heat pipes are not just hollow pipes. 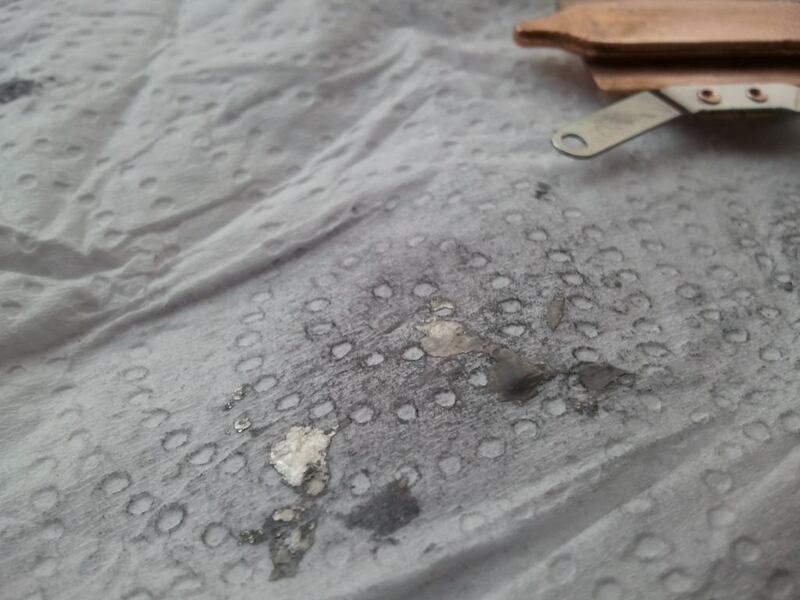 They contain a sealed gas chamber (and sometimes also a kind of metal foam) to allow heat transfer through the process of evaporation/condensation of the infill. You can have a look at some more technical explanation to see the working principle. OR!!! you could make a water reservoir with the fins inside sealed of course and put some hoses and water pump with tank to store water and remains portable but tedious to move around sometimes.... 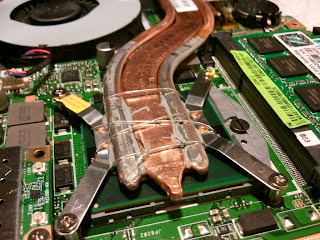 I did that way so I can get maximum cooling system as air is not as good as liquid in terms of heat conductivity. hey! ive been looking for some cooling mods on laptops and i actually thought of this. its amazing how well it performed! 10 degrees is A LOT, even more on a mobile computer. 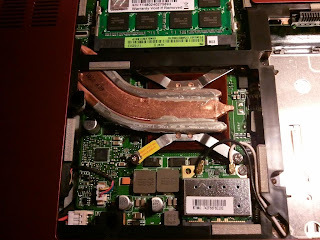 i upgraded my laptop from a Core i3 2350m to a Core i7 2670qm, so heat was going to be an issue. I think i have a few spare heatsinks, so ill try this as soon as i can. congratulations!